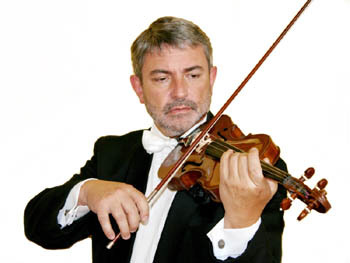 Peter Toth, who graduated from the Budapest Ferenc Liszt Music Academy in 1979 as a violinist, is PerTech's creator. During his studies he already showed an interest in instrument making, so he not only played his diploma recital on the 3rd instrument that he built, he also won an auditon, playing this instrument, for the Hungarian National Concert Orchestra which subsequently employed him. Shortly, he was sought after abroad and worked for more than 20 years in Germany, where he was a soloist and later led his own orchestra. Along side his successful musical career, being true to his ambition to be an instrument maker, he repaired his colleagues' instruments with pleasure. His vast knowlegde as a violinist gave him a great advantage in his calling to repair violins. As he gained more success in this area, he also received more and more requests. As much as possible, adjacent to his musical career, he did enough to meet these challenges. Until this day, it's been unknown that one person can have so much knowlegde as a violinist and be able to do such high standard repairs and restorations. For this reason, Mr. Toth has done the last repairs and restorations of many registered Stradivari, Guarneri, Guadagnini,etc. instruments. These repairs were all requests from friends. In 2001, Mr. Toth permanently returned home and in 2004 began working on his invention that has now been completed. Actually, the experience from 24 years that has been briefly noted here has led to the fact that certain things: accessories that are attached to the instrument, need to be changed for the violin and viola (partially applies to cello and double bass) so that it isn't necessary to alter the instument. It stays in its original condition.